International Sterling Co. 3-piece sterling silver coffee service, pattern C306, Federal/Neo-Classical style, including coffee pot, two-handled covered sugar and cream pitcher. 4 3/4" H to 9" H. 35.28 total oz troy. Each with script monogram "HPM". 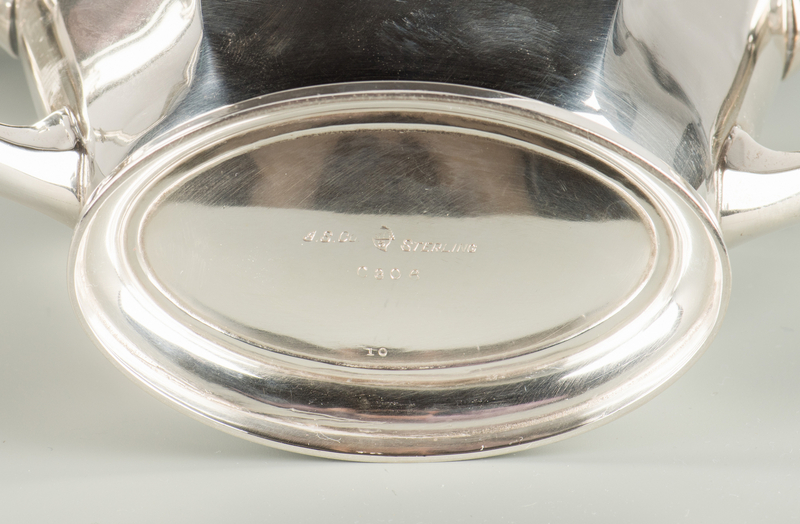 Group also includes two-handled rectangular waiter's tray marked "Wilcox S.P. Co., E.P. N. S., International S Co., W.M. Mounts", 1" H x 24 1/2" W x 11 1/4" D with same monogram. Provenance: Private collection, Knoxville, TN. CONDITION: Coffee service in very good condition with some surface scratches but no visible dents. Some wear on base of silver-plated tray. All pieces with monogram.